Upon recent questioning my mother maintains that when I was around seven-years-old the dog I loved and raised as my own was sent to a friendly farm out in the country when she and my father divorced and the dog couldn't for some reason come with us. But I have my doubts. Why was I never allowed to visit the dog again? I'm pretty sure it was the glue factory for Samantha, my white mutt with black spots that had been my everything for a few brief but vital years. My heart was broken, but then those were heartbreaking times all over the place. I thought about Samantha watching Lean on Pete, Andrew Haigh's entry into the "boy and his dog" canon opening in theaters this Friday - the "dog" is always an idea (I just called 2001 a "boy and his dog" movie earlier this week, after all - and so it's no big whoop for the "dog" here to be a horse; whatever it takes to break a young man's heart and in the process show him what it means to love, and lose, unconditionally. Them's the breaks, kid. 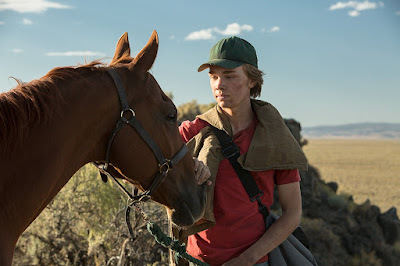 The horse is called "Lean On Pete" in the goofily cumbersome way race-horses are always tagged, but obviously Charlie (Charlie Plummer, proving his ace performance in King Jack a few years back was no fluke) does come to lean on this indifferent creature - his single father (played by Travis Fimmel doing his best Early Trashy Brad Pitt impersonation) means well (his mother abandoned them years ago) but he is just a big kid himself; there's nobody supporting Charlie so Charlie looks to improbable places for support. While out on a run Charlie stumbles upon the horse and then its owner Del (Steve Buscemi at his Buscemiest) and an unfriendly friendship forms - Del doesn't take to Charlie's post-pubescent boorishness but needs a helping hand and the kid's hard-working enough so he'll do. 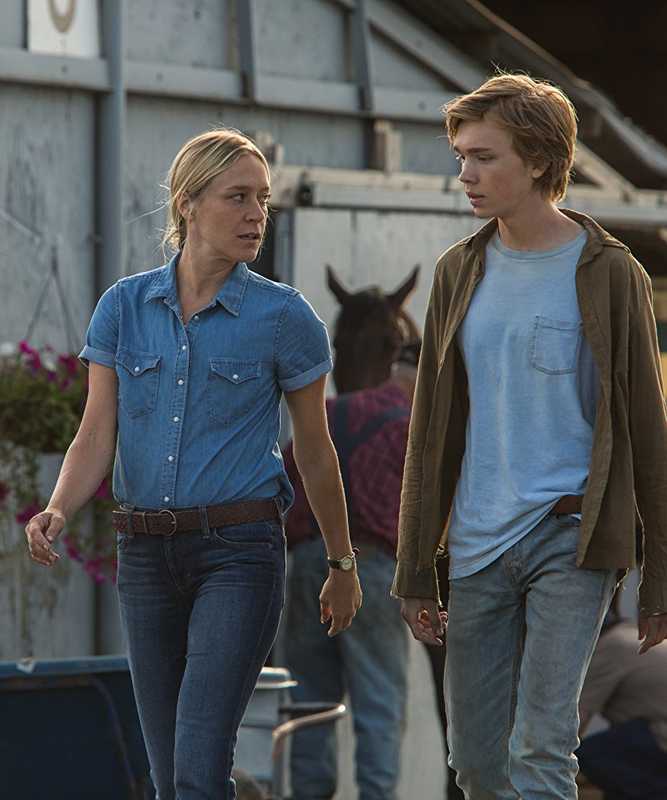 Chloë Sevigny swings in as a nice-enough lady jockey with life lessons about hard realities on hand and further sets the tone - this ain't nobody's Feel Good event of the summer. The road only rubs things down. 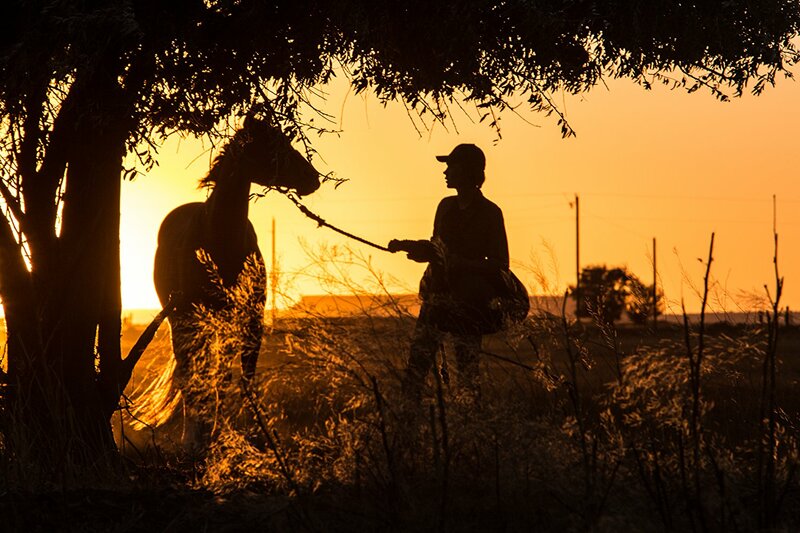 But it's so much better than feeling good, anyway - Lean On Pete is elegiac in the most reliable and comforting of ways at times, lapping full from the tank of its American Midwest Mood Board, all spotty desert-adjacent sunsets and pick-up trucks kicking up little mini dust storms. Pete trots and runs and his mane tosses in the wind, and Charlie stands beside him and then stands a little taller. We guess he sees something of himself reflected in the neutrality of the animal's black eyes; the movie never feels the need to spell it out, thank goodness. It's all there in those eyes. Those black, black eyes. Have I mentioned how discomfiting I find a horse's stare? Lean On Pete doesn't entirely disagree, because for all its tone-poem structure its heart remains distant, and the America it suffers through sinks into night awfully quick. We can go searching for something about ourselves here and get lost just as fast. Saw this film as at a screening. Far too indulgent. The protagonist is so constricted that we stop caring. Movie feels endless, and ending is too simple and easy. Admired for effort but I think the film is a failure and could not in anyway recommend it.